The anticipation I felt for yesterday’s Balenciaga collection was greater than any other show for the season. 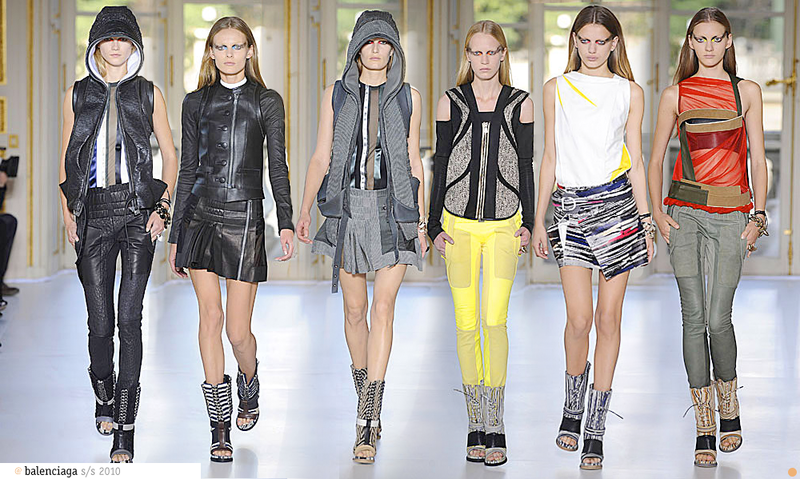 Nicolas Ghesquiere’s previous ready-to-wear offering had a lot of people divided. While some welcomed the break from the established, harsh, futuristic Balenciaga aesthetic, many were left bewildered in a sea of polka dots and hyper-feminine drapery. The show started a little after 10 a.m. at the Hotel de Crillon while I, on the other side of the world, refreshed my Twitter “balenciaga” search constantly in search of first glimpses. What was he going to put on display? The first photo of the first look immediately signaled somewhat of return to that image. If Balenciaga circa s/s 2007 was for the year 2100 and f/w 2009 was… 2009, yesterday’s collection was somewhere in between the two. In fact, it was pretty much an amalgamation of all Balenciaga collections since s/s 2006. There was waist drapery pretty akin to that of last season, strap paneling at the waists hearkened to the pants of Spring ’09, a panel palette very much similar to the drapery treatment of the season before that, the severity of ’07, and the sheer that pervaded much of ’06. Of course, the trademark pant cut was there as well. The list goes on. Usually I frown on derivative collections, but somehow this self-derivation just seems so, so right. Nicolas improved and, unsurprisingly, introduced beautiful new construction methods and amazing fabric combinations. What looked like textured leather on the sleeveless and hooded leather jacket openers was actually black tweed combined with black leather panels. What seemed like a simple pleated and pattern skirt, upon closer examination, was in fact two-tone pleated leather, laser-cut into unbelievably thin strips. Jaw-dropping, let’s be honest. The atmosphere at the Hotel de Crillon last fall, with its soft, ornate romanticism, was unquestionably feminine. If anything, last season’s show, in its distinct departure from the established star-trek chic, demonstrated the ephemeral nature of brand image. What we saw yesterday, still at the Hotel de Crillon but now with floors bare and glossy, seemed to be a forward and beautiful resolution to these two aesthetics.